OEM CONTITECH TIMING BELT KIT WATER PUMP VW GOLF PASSAT AUDI A3 A4 A6 2.0TDi. 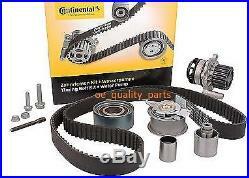 TIMING CAM BELT: CT1134 - CONTITECH Teeth: 160 Width: 30mm. WATER PUMP: WP6003 - CONTITECH. TENSIONER: V56340 - CONTITECH INA. GUIDE IDLER : V55735 - CONTITECH INA. GUIDE IDLER: V55465 - CONTITECH INA. GUIDE IDLER: V55767 - CONTITECH INA. 2.0 TDI 16V (2003.05 - 2012.08) 1968ccm - 140HP/103kW Engine: CBAB. 2.0 TDI (2003.05 - 2012.08) 1968ccm - 136HP/100kW Engine: CBAA. 2.0 TDI 16V quattro (2004.08 - 2012.08) 1968ccm - 140HP/103kW Engine: CBAB. 2.0 TDI (2008.04 - >) 1968ccm - 140HP/103kW Engine: CBAB. 2.0 TDI (2008.04 - >) 1968ccm - 136HP/100kW Engine: CBAA. 2.0 TDI 16V (2004.09 - >) 1968ccm - 140HP/103kW Engine: CBAB. 2.0 TDI (2004.09 - >) 1968ccm - 136HP/100kW Engine: CBAA. 2.0 TDI 16V quattro (2005.11 - >) 1968ccm - 140HP/103kW Engine: CBAB. 2.0 TDI (2007.11 - >) 1968ccm - 136HP/100kW Engine: CAGB. 2.0 TDI (2008.06 - >) 1968ccm - 120HP/88kW Engine: CAGC. 2.0 TDI quattro (2008.11 - >) 1968ccm - 143HP/105kW Engine: CAGA. AUDI A4 Allroad (8KH, B8). 2.0 TDI quattro (2009.09 - >) 1968ccm - 143HP/105kW Engine: CAGA. 2.0 TDI quattro (2009.09 - >) 1968ccm - 136HP/100kW Engine: CAGB. AUDI A4 Avant (8K5, B8). 2.0 TDI (2008.04 - >) 1968ccm - 143HP/105kW Engine: CAGA. 2.0 TDI (2008.04 - >) 1968ccm - 136HP/100kW Engine: CAGB. 2.0 TDI quattro (2008.04 - >) 1968ccm - 143HP/105kW Engine: CAGA. 2.0 TDI (2009.09 - >) 1968ccm - 136HP/100kW Engine: CAGB. 2.0 TDI (2004.07 - 2011.03) 1968ccm - 136HP/100kW Engine: CAGB. AUDI A6 Avant (4F5, C6). 2.0 TDI (2005.06 - 2011.08) 1968ccm - 136HP/100kW Engine: CAGB. 2.0 TDI quattro (2009.08 - >) 1968ccm - 143HP/105kW Engine: CAGA. 2.0 TDI quattro (2009.08 - >) 1968ccm - 136HP/100kW Engine: CAGB. 2.0 TDI (2008.12 - >) 1968ccm - 143HP/105kW Engine: CAGA. 2.0 TDI (2008.12 - >) 1968ccm - 120HP/88kW Engine: CAGC. 2.0 TDI (2009.05 - >) 1968ccm - 143HP/105kW Engine: CAGA. 2.0 TDI (2009.07 - >) 1968ccm - 120HP/88kW Engine: CAGC. 2.0 TDI 4x4 (2009.05 - >) 1968ccm - 140HP/103kW Engine: CBDB. 2.0 TDI (2012.12 - >) 1968ccm - 140HP/103kW Engine: CJAA. 2.0 TDI 16V (2008.05 - >) 1968ccm - 140HP/103kW Engine: CBAB. VW GOLF PLUS (5M1, 521). 2.0 TDI 16V (2005.01 - >) 1968ccm - 140HP/103kW Engine: CBDB. 2.0 TDI (2005.05 - >) 1968ccm - 136HP/100kW Engine: CBDA. 2.0 TDI (2009.01 - >) 1968ccm - 110HP/81kW Engine: CBDC. 2.0 TDI (2003.10 - 2008.11) 1968ccm - 136HP/100kW Engine: CBDA. VW GOLF V Variant (1K5). 2.0 TDI 16V (2007.06 - >) 1968ccm - 140HP/103kW Engine: CBDB. 2.0 TDI (2008.10 - 2013.05) 1968ccm - 140HP/103kW Engine: CBAB. 2.0 TDI (2008.10 - 2012.11) 1968ccm - 110HP/81kW Engine: CBDC. 2.0 TDI 4motion (2009.05 - 2012.11) 1968ccm - 140HP/103kW Engine: CBAB. 2.0 TDI (2008.10 - 2012.11) 1968ccm - 136HP/100kW Engine: CBAA. VW GOLF VI Variant (AJ5). 2.0 TDI 16V (2009.07 - >) 1968ccm - 140HP/103kW Engine: CBDB. 2.0 TDI (2009.07 - >) 1968ccm - 136HP/100kW Engine: CBDA. 2.0 TDI 16V (2005.08 - 2010.10) 1968ccm - 140HP/103kW Engine: CBDB CJAA. 2.0 TDI (2005.09 - 2010.10) 1968ccm - 136HP/100kW Engine: CBDA. 2.0 TDI (2011.02 - 2012.04) 1968ccm - 140HP/103kW Engine: CJAA. 2.0 TDI 16V (2005.03 - >) 1968ccm - 140HP/103kW Engine: CBAB. 2.0 TDI (2005.08 - >) 1968ccm - 170HP/125kW Engine: CBBB. 2.0 TDI 16V 4motion (2005.03 - >) 1968ccm - 140HP/103kW Engine: CBAB. 2.0 TDI (2005.03 - 2010.11) 1968ccm - 136HP/100kW Engine: CBAA. 2.0 TDI (2008.11 - 2010.07) 1968ccm - 110HP/81kW Engine: CBDC. 2.0 BlueTDI (2009.01 - >) 1968ccm - 143HP/105kW Engine: CBAC. 2.0 TDI 4motion (2009.05 - >) 1968ccm - 170HP/125kW Engine: CBBB. 2.0 TDI (2008.05 - 2008.11) 1968ccm - 163HP/120kW Engine: CBBA. 2.0 TDI (2008.06 - >) 1968ccm - 140HP/103kW Engine: CBAB. 2.0 TDI (2008.06 - 2011.05) 1968ccm - 136HP/100kW Engine: CBAA. 2.0 BlueTDI (2009.05 - 2010.11) 1968ccm - 143HP/105kW Engine: CBAC. 2.0 TDI 4motion (2009.08 - >) 1968ccm - 140HP/103kW Engine: CBAB. 2.0 TDI 16V (2005.08 - >) 1968ccm - 140HP/103kW Engine: CBAB. 2.0 TDI (2005.08 - 2010.11) 1968ccm - 136HP/100kW Engine: CBAA. 2.0 TDI 16V 4motion (2005.08 - >) 1968ccm - 140HP/103kW Engine: CBAB. 2.0 TDI (2008.11 - 2010.11) 1968ccm - 110HP/81kW Engine: CBDC. 2.0 TDI (2008.08 - >) 1968ccm - 140HP/103kW Engine: CBDB. 2.0 TDI (2008.08 - >). 1968ccm - 170HP/125kW Engine: CBBB. 2.0 TDI 4motion (2007.09 - >) 1968ccm - 140HP/103kW Engine: CBAB. 2.0 TDI (2008.03 - >) 1968ccm - 140HP/103kW Engine: CBAB. 2.0 TDI 4motion (2007.11 - >) 1968ccm - 136HP/100kW Engine: CBAA. GENERALLY, ALL OUR ITEMS ARE HELD IN STOCK. NO WAITING PERIODS, IMMEDIATE DISPATCH. CUSTOMERS SHOULD SATISFY THEMSELVES THAT ANY ITEM CHOICE MADE IS SUITABLE FOR THEIR INTENDED PURPOSE OR USE. The item "OEM CONTITECH TIMING BELT KIT WATER PUMP VW GOLF PASSAT B6 AUDI A3 A4 A6 2.0TDi" is in sale since Saturday, July 04, 2015. This item is in the category "Vehicle Parts & Accessories\Car Parts\Engines & Engine Parts\Other Engines & Engine Parts". The seller is "oe_quality_parts" and is located in Bialystok. This item can be shipped worldwide.